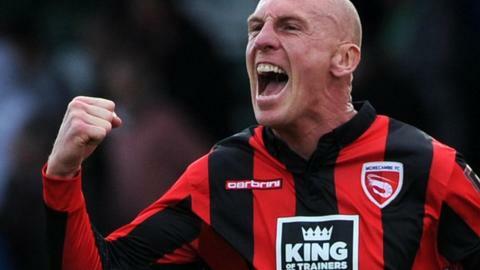 Morecambe fought back from two goals down to see off 10-man Yeovil Town in a thrilling encounter. Yeovil led 2-0 after a rollercoaster first half thanks to Harry Cornick's shot and Omar Sowunmi's header either side of Shaun Jeffers' dismissal. But Aaron Wildig hooked in and Andrew Fleming poked home to level. Lee Molyneux then clinically finished off a quick counter-attack before substitute Kevin Ellison headed in the fourth to wrap up a dramatic win. Match ends, Yeovil Town 2, Morecambe 4. Second Half ends, Yeovil Town 2, Morecambe 4. Goal! Yeovil Town 2, Morecambe 4. Kevin Ellison (Morecambe) header from the left side of the six yard box to the bottom right corner. Assisted by Paul Mullin. Attempt blocked. Paul Mullin (Morecambe) right footed shot from the right side of the box is blocked. Kevin Ellison (Morecambe) hits the right post with a header from the left side of the six yard box. Goal! Yeovil Town 2, Morecambe 3. Lee Molyneux (Morecambe) left footed shot from the left side of the box to the bottom right corner. Assisted by Aaron Wildig following a fast break. Corner, Yeovil Town. Conceded by Kevin Ellison. Corner, Yeovil Town. Conceded by Adam Dugdale. Substitution, Yeovil Town. Mark Beck replaces Iffy Allen. Attempt missed. Ryan Bird (Yeovil Town) header from very close range is close, but misses to the left. Attempt saved. Andrew Fleming (Morecambe) right footed shot from the centre of the box is saved in the centre of the goal. Substitution, Morecambe. Kevin Ellison replaces Shaun Miller. Attempt blocked. Paul Mullin (Morecambe) right footed shot from the centre of the box is blocked. Corner, Morecambe. Conceded by Iffy Allen. Attempt blocked. Harry Cornick (Yeovil Town) left footed shot from the right side of the box is blocked. Harry Cornick (Yeovil Town) wins a free kick in the defensive half. Foul by Adam Dugdale (Morecambe). Goal! Yeovil Town 2, Morecambe 2. Andrew Fleming (Morecambe) right footed shot from the right side of the six yard box to the top right corner. Assisted by Laurence Wilson with a cross. Corner, Morecambe. Conceded by Jordan Gibbons. Substitution, Yeovil Town. Ryan Bird replaces Omar Sowunmi. Goal! Yeovil Town 2, Morecambe 1. Aaron Wildig (Morecambe) right footed shot from the centre of the box to the top right corner. Assisted by Paul Mullin with a cross. Corner, Morecambe. Conceded by Stephen Arthurworrey. Corner, Morecambe. Conceded by Artur Krysiak. Attempt saved. Lee Molyneux (Morecambe) left footed shot from outside the box is saved in the top right corner. Ryan Edwards (Morecambe) is shown the yellow card for a bad foul. Omar Sowunmi (Yeovil Town) wins a free kick in the attacking half. Foul by Ryan Edwards (Morecambe). Substitution, Morecambe. Paul Mullin replaces Alan Goodall. Attempt missed. Lee Molyneux (Morecambe) left footed shot from outside the box is close, but misses the top left corner. Attempt missed. Lee Molyneux (Morecambe) left footed shot from outside the box is high and wide to the left from a direct free kick. Tom Barkhuizen (Morecambe) wins a free kick in the defensive half. Second Half begins Yeovil Town 2, Morecambe 0. Substitution, Morecambe. Lee Molyneux replaces Aaron McGowan. First Half ends, Yeovil Town 2, Morecambe 0.